Mining Law Canada Blog | Updates and opinions affecting the mining industry in Canada. Sarane Sterckx, Project Manager, Goldspot Discoveries Inc. Guy Desharnais, Director of Mineral Resource Evaluation, Osisko Gold Royalties Ltd.
Dentons partner Mira Gauvin moderated the panel, and the event was chaired by WIM Montréal president Kimberly Darlington of Refined Substance. SNC-Lavalin provided an interactive demonstration of equipment from its Innovation Centre in Toronto at the start of the luncheon. With each panelist contributing insights from his or her own area of expertise, several themes emerged from the discussion. First, AI has serious potential to revolutionize numerous aspects of the mining industry. From analyzing geological survey results to directing autonomous vehicles to monitoring environmental or health & safety conditions, AI can be a useful tool in any application that blends data analysis with predictive capacity. As a data-driven industry, mining is a natural fit for AI. What’s more, many of the legal concerns that typically arise with AI, such as privacy and ethical questions, are typically not at issue in the natural resources sector since the data is purely scientific and technical in nature. Second, as useful as it promises to be, AI is no magic bullet. Implementing AI requires the creation of multidisciplinary teams – including geologists, data scientists and, yes, even legal counsel! – to ensure that the project addresses the business’ real needs. The AI tools will need to be tested and retested before being deployed, and employees will need to be trained to use them properly. It also requires buy-in from senior management, who will often want to see proof of its value before making the required investments – and as the technology is so new and changing so rapidly, that proof is not always easy to provide. Third, it’s essential not to neglect the legal aspects of implementing AI. Who is liable if something goes wrong: the software provider, the mining company, a third-party consultant or someone else in the supply chain? When drafting their contracts, the parties need to ensure to include the language necessary to protect them, including clear descriptions of the software being provided and its limitations, representations and warranties regarding the training data and the performance of the finished product, and indemnification provisions. What about intellectual property considerations, such as whether the company has the necessary rights to the training data or who will own any new IP that may be created by the AI software itself? What’s for certain is business applications of AI are still in their infancy. As new use cases emerge, practical applications tested and best practices crafted, the technical, legal and other considerations that AI entails will evolve in ways that we in 2019 can’t yet envision. Only by closely monitoring developments in both the mining and technology sectors can an observer hope to keep up with the rapid pace of development that undoubtedly will only accelerate in the future. a force majeure (FM) clause allows a party to a contract to invoke a “force majeure right”, the effect being that the invoking party will be relieved of its contractual obligations to the extent that the performance of those obligations “is prevented or delayed by an event beyond its reasonable control”. The concept of force majeure does not exist under common law, but only exists by virtue of contract and therefore it must be included in the contract itself in order to be relied on. It is important to note that FM is not equivalent to the concept of “frustration” at common law. Rather, frustration of a contract occurs when an event so significantly changes the nature of the contract from what was contemplated that both parties are discharged from the whole of the contract. By contrast, an FM clause only excuses non-performance or a delay in performance as a result of, and during, the FM event such that neither party is in breach of the contract (nor liable for damages for breach of contract). An FM clause in a contract should include general language covering “any event beyond the reasonable control of a party”. This broad language provides the parties with a lot of flexibility to try to bring many different types of events within its potential scope. However, as there can inevitably be disagreement among the parties in the future about whether or not a specific event falls within the meaning of the general language, it is recommended that the parties should also stipulate the specific FM events that they agree neither party should bear the risk of in the context of their particular contract having regard to the specific circumstances surrounding the contract and its subject matter (such as the services to be provided, the nature of the product to be transported, the location of the mining project, the type of equipment and labour used in performing the services). A determination of whether an alleged FM event fits into the specific FM events articulated in the contract must be determined on a case-by-case basis. Generally speaking, the courts will give words in a contract their plain and ordinary meaning. Accordingly, if a party wishes to rely on a specific FM event, the ordinary meaning of that provision must contemplate the alleged FM event. Mining suppliers should carefully consider what events and circumstances relating to their ability to perform the provisions of a supply contract (or other related contracts) should be included in the FM clause, and should stipulate any event that they are concerned might potentially hinder or prevent the performance of their obligations under the contract. To mitigate risk, mining suppliers will want to, at a minimum, also include in their supply agreements the specific FM events contemplated in the related transportation and port agreements that could affect their ability to deliver their product under a supply agreement. A lack of funds by a party should never be an FM event. The parties should also consider whether after a certain period of delay or non-performance as a result of an FM event, either party should be permitted to terminate the contract (i.e. 60 days, 6 months). The applicable period of time that the FM event needs to last in order to permit a termination of a specific contract will depend on the subject matter of the contract and a consideration of whether a delay in or non-performance of obligations for that period of time would materially affect the substance of the contract such that either party should be permitted to end the relationship. In many cases, however, the early termination of a contract as a result of an FM event may not be an appropriate remedy, particularly for an exclusive or long-term contract that otherwise has few termination provisions available to the parties. It is important to note that an FM clause does not actually amend any contractual provisions such as a liquidated damage payment clause or reduce guaranteed volume delivery requirements and the requirement to pay related deficiency payments. If the parties wish for those provisions not to apply or to provide for some type of reduction in guaranteed volume deliveries in a year as a result of an FM event, the contract should specifically state that and provide a mechanism for how those guaranteed volume deliveries are to be adjusted in the event of an FM event. As a FM clause provides a “force majeure right”, in order to properly exercise that contractual right, an invoking party should strictly comply with the FM event clause regarding what exact steps are required to be taken by that invoking party to rely on it in the first instance (and in order to continue to rely on it) and the specific notice provisions set out in the contract must be strictly followed. On December 18, 2018, notice of work applications for placer mines, aggregates and mineral explorations can now be submitted by filing on the Natural Resource Online Services website. A British Columbia electronic identification number is required for either a business or individuals and this can be obtained by setting up an account with Natural Resource Online Services. As part of the notice of work, it can be bundled with the explosive magazine storage and use permit, occupant licence to cut and section 10 of the Water Sustainability Act. Note that if a water permit is related to a stream under section 11 of the Water Sustainability Act, a separate application is required. Additional information can be obtained here. Everyone is talking about blockchain. The concepts may be fuzzy, but the consensus is that the technology will revolutionize the way we do just about everything. The mining industry is no exception and it is clear that blockchain and its cousin, the smart contract, show great promise as an addition to a mining company’s toolkit. My colleague, Tracy Molino, and I co-authored this piece in Canadian Mining Magazine about use cases for blockchain in the mining industry, so check it out here and reach out if you have any questions. An Alberta court has held that provisions of the Bankruptcy and Insolvency Act allowing a trustee or receiver to disclaim real property without assuming environmental liabilities in relation thereto renders inoperable provincial legislation that would otherwise seek to impose such liability on the trustee or receiver. The Court further held that a provincial regulatory body could not use its regulatory powers to block the sale of assets in insolvency proceedings. Although this case dealt with provincial legislation in the energy sector, the principles of paramountcy articulated therein would apply equally in the mining space. Effective May 9, 2016, the Canadian Securities Administrators will implement new take-over bid rules that will introduce significant changes to bid mechanics, including lengthier minimum deposit periods. For a description of the changes, see here. A recent court decision led to the failure of an attempted acquisition of an exploration company by a listed issuer, in part due to conflicts of interest. We analyze the decision, and provide commentary on the law and practice of managing conflicts, in this Dentons Insight. This summary was co-authored by Daniel McElroy, Knowledge Management Lawyer in Dentons’ Vancouver office. Mining exploration activities in Canada have attracted widespread interest over the past few decades and is today considered by most as a sector in its own right. Flow-through shares financings have helped raise significant capital for mining companies. However, when evaluating the suitability of a flow-through financing, an operating corporation must also assess the discounted value of the tax deductions and tax incentives it is intending to forgo. Discounting their value allows the corporation to better appraise their current worth and more accurately evaluate the premium it must obtain to make flow-through financing economically advantageous. See our Dentons Insight. As noted in the September 1, 2015 posting below, recent rule changes have required senior Canadian public companies to disclose their policies and record on the appointment of women as directors and executive officers. Our recent Insight summarizes the initial results of and response to these new disclosure rules, and indicates what further changes may lie ahead. 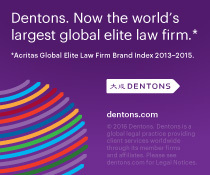 See our Dentons Insight. Mining issuers have their qualified persons (“QPs”) and occasionally legal counsel review technical disclosure, including news releases and technical reports, to ensure they comply with National Instrument 43-101 Standards of Disclosure for Mineral Projects (“NI 43-101”). Some mining issuers might not realize that information found on their websites and other presentations, including investor relations materials, is captured by the definition of “written disclosure” in NI 43-101 and disclosure requirements apply. Common areas of non-compliant disclosure on mining issuers’ websites include investor presentations, fact sheets, media articles, failure to update material information and links to third party content. On April 9, 2015, the Canadian Securities Administrators published CSA Staff Notice 43-309 Review of Website Investor Presentations (“Staff Notice 43-309”), which highlighted findings from a review of investor presentations on mining issuers’ websites, conducted by staff of the British Columbia Securities Commission, the Ontario Securities Commission, and the Autorité des marchés financiers (collectively, the “Regulators”). This review also included a review of mining issuers’ forward looking information (“FLI”) against the requirements of Part 4A of National Instrument 51-102 Continuous Disclosure Obligations (“NI 51-102”). Of the 130 mining issuers reviewed, the Regulators sent letters to 49 mining issuers requiring them to amend their investor presentations and correct the non-compliant disclosure, resulting in outcomes from mining issuers confirming future compliance with the requirements, to issuing a corrective news release, to filing or refiling a technical report. The majority of the corrective news releases and technical report filings or refilings resulted from non-compliant disclosure of economic studies, preliminary economic assessments (“PEAs”), mineral resources, mineral reserves, exploration targets, historical estimates, or overly promotional language. 1. Naming the QP: An issuer must include the name of the QP and their relationship to the issuer for all documents containing scientific or technical disclosure, including websites and investor relations materials. All technical information must either be approved by a qualified person or based upon information prepared by or under the supervision of a qualified person. In the latter case, an issuer must ensure that the technical information is consistent with the information provided by the QP. An issuer should consider having the QP review disclosure that summarizes or restates a technical report or technical advice or opinion to ensure that the disclosure is accurate. a. Caution that mineral resources are not mineral reserves: The disclosure of results of an economic analysis of mineral resources must include an equally prominent statement that “mineral resources that are not mineral reserves do not have demonstrated economic viability”. b. Inclusion or exclusion of mineral reserves in mineral resources: When reporting both mineral resources and mineral reserves, an issuer must include a clear statement whether mineral resources include or exclude mineral reserves. While practices on this matter vary, the CIM Estimation Best Practice Committee from 2003 recommends that mineral resources should be reported separately and exclusive of mineral reserves. 4. Exploration targets: If an issuer discloses an exploration target, both the potential quantity and grade of the exploration target must be expressed as ranges and be accompanied by an equally prominent statement that “the potential quantity and grade is conceptual in nature, there has been insufficient exploration to define a mineral resource” and that “it is uncertain if further exploration will result in the target being delineated as a mineral resource”. 5. Historical estimates: Each time an issuer discloses historical estimates, the issuer must include information about the source, date, reliability, key assumptions and other factors, and the following, equally prominent statements: “a qualified person has not done sufficient work to classify the historical estimate as current mineral resources or mineral reserves” and “the issuer is not treating the historical estimate as current mineral resources or mineral reserves”. 1. Taxes in economic studies: Financial results and the cash flow model for an “advanced property” (which includes results of a PEA, pre-feasibility or feasibility study) must include assumptions that have an economic impact such as taxes, royalties, and other government levies. In respect of such tax matters relevant to a technical report, we note that a QP may rely on a report, opinion or statement of another expert who is not a QP, or on information provided by the issuer, and may include a limited disclaimer of responsibility, provided the QP discloses: (i) the source of the information relied upon, including the date, title, and author of any report, opinion, or statement; (ii) the extent of reliance; and (iii) the portions of the technical report to which the disclaimer applies. 2. Metal price assumptions: When reporting mineral resources and mineral reserves, an issuer must ensure the assumed metal or commodity price, and the cut-off grade, are clearly stated, as well as the effective date of the reported estimate. For investor presentations, this information could be provided in an appendix. 3. Technical report triggers: An issuer must ensure that PEA disclosure on its website is supported by an existing technical report. Disclosing economic projections in investor presentations, fact sheets, posted or linked third party reports, or any statements on the issuer’s website may trigger the filing of a technical report to support the disclosure. Such PEA disclosure can include forecast mine production rates that might contain capital costs to develop and sustain the mining operation, operating costs, and projected cash flows. 4. FLI compliance: An issuer should ensure that FLI disclosure in investor presentations provides the material factors and assumptions used to develop the FLI. Examples of FLI include metal price assumptions, cash flow forecasts, projected capital and operating costs, metal or mineral recoveries, mine life and production rates, and other assumptions used in preliminary economic assessments, pre-feasibility studies, and feasibility studies. 5. Overly promotional terms and potentially misleading information. An issuer should avoid terms and statements that may be overly promotional or misleading. Terms which may be used inappropriately in certain circumstances include, “world-class”, “spectacular and exceptional results”, “production ready”, “ore” in relation to mineral resources, and “management estimates”. a. Exploration information about quality assurance/quality control and naming the laboratory. b. Data verification – data verification is the process of confirming that the data underlying the written disclosure has been properly generated, was accurately transcribed, and is suitable for the purpose that the data is used. c. Information about the nature and context of drilling results such as true width and higher grade intersections. In some cases, investor presentations may be able to include representative drill sections or other figures showing mineralized intervals to assist in providing the necessary information. d. Metal price assumptions. However, if the assumed metal or commodity price is significantly below or above current prices, an issuer should clearly state the key assumptions to ensure the disclosure is not misleading. Ultimately, if an issuer is in doubt about whether disclosure on its website or in its investor presentations complies with NI 43 101, the issuer can have a QP or legal counsel review the applicable disclosure. We also recommend that an issuer’s website does not include links to third party content, such as analysts’ reports. National Policy 51-201 Disclosure Standards (“NP 51-201”) provides that if an issuer elects to post to its website or otherwise publish the names of analysts who cover the issuer and/or their recommendations, the names and/or recommendations of all analysts who cover the issuer should be similarly posted or published. This applies whether the analysts’ coverage of the issuer is positive or negative. NP 51-201 also provides that an issuer that redistributes an analyst’s report risks being seen as endorsing that report. This may trigger a requirement for the issuer to file a technical report, depending on the content of the analyst’s report. On Sunday March 1, 2015, the Honourable Joe Oliver, Federal Minister of Finance addressed the Prospectors & Developers Association of Canada (“PDAC”) at the annual PDAC Convention in Toronto and announced certain proposals aimed at bolstering Canada’s junior mining industry. First, the Government has announced that it intends to extend the 15% Mineral Exploration Tax Credit (“METC”) for flow-through share investors for an additional year. The METC was scheduled to expire on March 31, 2015. The METC was first introduced in 2000 as a temporary measure which expired in 2003. Since 2003, the Department of Finance has extended the METC annually, one year at a time. The Government has also modified its previous position with respect to the types of expenses that will qualify as Canadian exploration expenses (“CEE”). Expenses which qualify for CEE treatment are 100% deductible in the year they are incurred. Additionally, certain types of CEE may be renounced to investors pursuant to flow-through share agreements which enable junior mining companies to raise capital and fund exploration programs. In a letter to PDAC dated September 19, 2007, the Canada Revenue Agency (“CRA”) provided certain guidelines in determining whether certain expenses incurred at the exploration stage qualified as CEE. In that 2007 letter, the CRA took the position that environmental assessments and community consultations undertaken to meet a legal requirement to obtain a permit would not be eligible for CEE treatment as these costs are not incurred for the purpose of determining the existence, location, extent or quality of a mineral resource in Canada. In his speech, Minister Oliver announced the government’s intention to modify the definition of CEE contained in the Income Tax Act (Canada) to provide that effective March 1, 2015, the costs associated with undertaking environmental studies and community consultations as a pre-condition to obtaining a licence or permit to explore will qualify as CEE. These proposed tax measures are welcome particularly since many mining companies are facing challenges in securing capital. Dentons is proud to be a Silver Sponsor of Mining & Investment Latin America Summit, the largest mining and investment event in Latin America. Mining & Investment Latin America Summit is the only event that focuses on mining investment and efficiency strategies in Latin America, bringing together mining companies; companies with mining assets in Latin America; local, regional and international investors and financial service providers. Please join us on Day 1 at 9:40 a.m. for a government and mining company panel discussion regarding optimizing the relationship between both parties to ensure long term growth and development. The distinguished panelists include Dr. Beatriz Uribe, President of Mineros; Patricia Fortier, Ambassador, Embassy of Canada, Peru; and Brian Abraham, Partner, Mining, Dentons Canada LLP. Dentons Canada mining partner Jaime McVicar will also attend the Summit. Brian and Jaime look forward to getting together with you for two days of business matching, knowledge sharing and deal-making. The Province of British Columbia approved an Order in Council dated April 11, 2014 to establish environmental assessment fees in British Columbia for the review of environmental assessment applications, orders and enforcement fees. The fee structure became effective on April 14, 2014. There are three categories of fees: 1. pre-certificate fees; 2. transitional assessment fees; and 3. post-certificate fees. There is an exemption fee of $10,000 payable when a party seeks an exemption from the requirement for an environmental assessment certificate. The first installment for an assessment fee ranges from “simple” at $25,000 to “typical” at $75,000 and the assessment fee for the second installment ranges from $25,000 to $75,000. Transitional assessment fees range from “simple” at $37,500 to “complex” at $112,500. Post certificate fees for an extension range from $2,000 to $10,000 and an amendment fee ranges from $2,000 to $50,000. In addition, there are inspection fees imposed and the timelines for the payment of the fees are as set out in the regulations. There are a number of factors that are used to determine the fees and these are set out in the materials available on the government website at http://www.eao.gov.bc.ca/fees.html. On February 7, 2014, BCAMTA opened its office in Terrace to guide and support aboriginal people towards gaining employment in the mining and exploration industry. There are a number of mines planned in the Terrace area and the need for employees, particularly those who have local connections would assist the mining sector for employing local people. The mineral exploration tax credit has been extended for a further one-year period. This provides a 15% tax credit for flow-through share investors. Other items which would impact the mining industry include amendments to the Hazardous Products Act, an allotment of $40 million for the Norther Economic Development Program over a two-year period and a number of Human Resource initiatives, principally with respect to training. The government has also proposed changes with respect to corporate transparency, particularly in the area of access to information and corporate beneficial ownership.